There are multiple ways to change the text size using your browser. These techniques work on most web pages. One approach is to use your web browser's menu. In the following example we are using Microsoft Internet Explorer 7™. Your browser's menus may differ somewhat from the example, depending on the vendor and version. 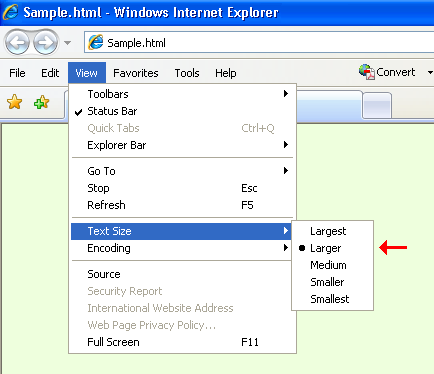 In the above example, one clicks on the View menu, and then Text Size to see a menu of size options. Select the desired size. Another way to change text size is to use keyboard commands. Hold down the Ctrl (control) key and then the plus key ("+") at the same time to enlarge text. Use the plus key near the top, just below or near the F11 key (on most keyboards), not the one on the right side in the numeric pad. The above diagram shows the approximate positions of the participating keys. Note that there are two Ctrl keys on most keyboards.